High-rise glass replacement is one of the most difficult and expensive operations. Traditionally, you need to start by getting a permit, then install scaffolding to make the operation possible, and finally, specialists will take a few days to glaze the building. This operation is awkward, long, and expensive, and we can fix all that. We offer professional rope access glazing that is fast, inexpensive, and doesn’t require a permit from the government. 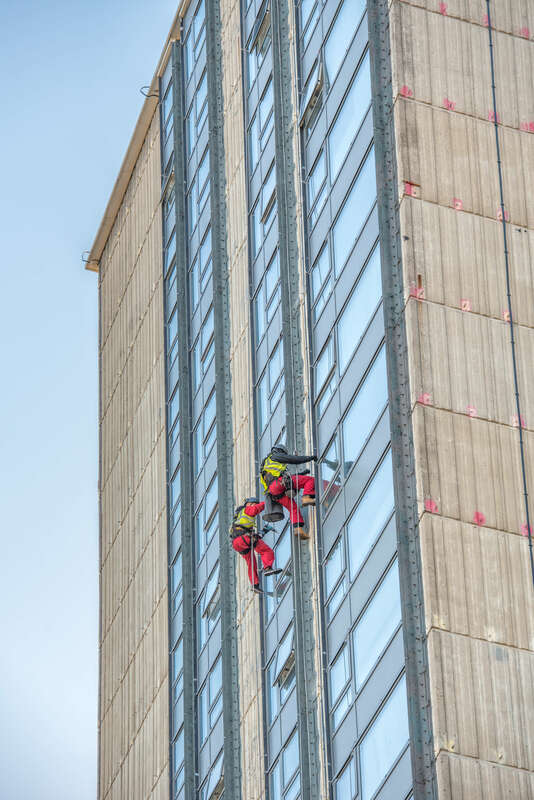 Our team consists of abseiling specialists that have extensive experience working on high-rise glazing all over London. We’ve worked with big companies, including contractors and homeowners, and our wide range of experience helps us do a fast and error-free job. Having old and uninsulated windows is a major driving factor for increased electricity bills. Due to all the heat loss from this glass, it will take much more energy just to keep the building warm. So, you won’t only refresh the outward appearance of the building, but you’ll also save money in the long run. That’s why our offer of high-level glass replacement without any permits or headache is an indispensable offer that you’ll surely want to take us up on.